Competitive gymnastics is for gymnasts wanting to take their passion for gymnastics to the next level. 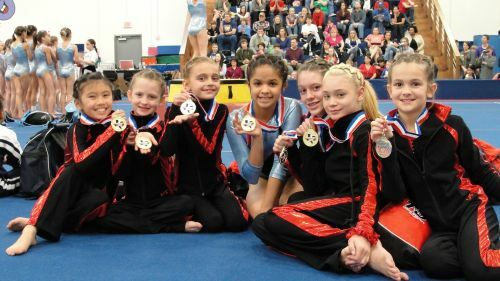 Our program competes in the USA Gymnastics program and offers a fun, family friendly atmosphere in which girls are trained to be hard working competitive athletes. We have had several years of success with many top team finishes and individual state champions. We look forward to another succesful year! Online registration is not available for this competitive program because an evaluation is needed to be placed. Please see our complete Competitive Gymnastics Information Packet in the "Forms" link under the "Gym Info" tab.